Thommy Hutson is an award-winning screenwriter, producer, and author who is considered the foremost authority on A Nightmare on Elm Street. A graduate of UCLA, Thommy also wrote and produced critically acclaimed genre projects such as Scream: The Inside Story, Never Sleep Again: The Elm Street Legacy, More Brains! A Return of the Living Dead, His Name was Jason: 30 Years of Friday the 13th, and Crystal Lake Memories: The Complete History of Friday the 13th. Thommy is currently developing a horror/thriller anthology TV series (standalone episodes every week) with director/producer Louis Shaw Milito (CSI, GOTHAM, LUCIFCER, THE EXORCIST) to be written and/or directed by different people from the genre including Clive Barker, Mick Garris, Rachel Talalay, Brian Yuzna, William Malone, and Jeffrey Reddick. In addition to original material, the series will include adaptions from bestselling anthologies. Jinxed is a horror novel for young and new adults written by Thommy Hutson. The Trask Academy of Performing Arts was the ultimate in elite academic institutions dedicated to perfecting the already prodigious skills of the young men and women whose parents were able to afford the exorbitant tuition fees. The institution was as steeped in the lure of the unknown as the island upon which it was perched and the man for whom it was named. Cadogan’s reclusive nature was perfectly suited for the remote island located twenty-two miles out at sea from the mainland. His home, which became The Trask Academy, was accessible through only one gate, and the island did not have cellphone coverage. And while the grounds and the buildings were indescribably beautiful, there was the pervading sense of some danger looming, breeding within the burnt-out shell of the theatre that still squatted forlornly on the grounds some twenty years after the fiery conflagration that took the life of a promising young actor. Layna, her boyfriend Max, and their friends were fascinated by that theatre, which seemed a fertile spot for the spooky games and pranks they liked to play on each other. While they all considered it an eyesore and wondered why it was left there so tarnished in such an elite institution, Layna sensed something deeper, darker and more chilling in the remnants of those fire-scorched seats and dusty construction materials. There was something infinitely more horrifying lurking in The Trask Academy than any of them realized. 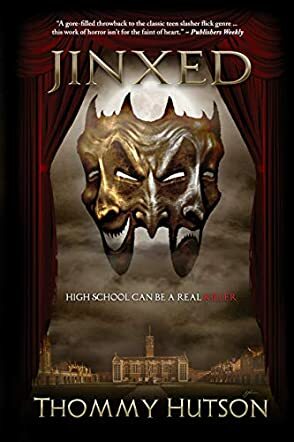 Thommy Hutson’s contemporary horror novel, Jinxed, is a taut and suspenseful tale about a deadly masked killer and the elite performing arts academy that has been turned into its hunting grounds. Hutson’s plot twists and turns as much as the manicured grounds and intricate library of The Trask Academy, and his characters are well-defined and credible. I especially appreciated the mystery element that is woven throughout the tale; the concept of the secrets and lies that have subtly insinuated themselves throughout the fabric of the buildings and grounds, and the theatrical appearance of the killer who seems preternatural in its brutal powers and deadliness. Hutson’s tale had me pleasurably remembering Agatha Christie mysteries, such as And Then There Were None where the victims were held incommunicado on an island along with a crazed killer. I loved watching as Layna and her friends work to identify the killer while they try to stay alive. Jinxed does admirable double-duty as horror and homage to classic mystery; and it does so brilliantly. It’s most highly recommended. Jinxed by Thommy Hutson is a gory horror tale with a touch of the psychological thriller thrown in for good measure. The Trask Academy of Performing Arts is an exclusive school, standing alone on an island. One by one, some of the top students are being murdered in the most horrific ways. It doesn’t take Layna Curtis long to realize that there is something more going on here; these deaths are not random. Superstitious ideas are being used to kill and Layna needs to convince everyone of her theory. She soon realizes that the deaths have been a way to clear the path to the real victim – her – and along the way Layna discovers that she isn’t who she thought she was as she uncovers secrets and lies about her past. Who is behind these heinous crimes and will Layna live to tell the tale? Will anyone else escape the clutches of a mad butcher? Jinxed by Thommy Hutson is a graphic novel with some pretty descriptive murder scenes – if you have a weak stomach or just aren’t into gruesome murders, then this is not the book for you. For the rest of you, I promise you will not put this down. It gripped me from the start and, despite the vivid details, I could not tear myself away from the story. This is a very clever plot, clearly detailed and a great deal of work must have gone into getting this just right. There was plenty of tension along the way, plenty of blood spilled and lots of psychological nuances. Every time I thought I had guessed who was behind it, I was wrong and there is a neat little twist near the end, one that you won't see coming. That said, I didn’t expect the ending this story had either so it’s full of surprises all the way through. The characters were truly identifiable, written perfectly and developed fully, and I guarantee that you will draw some parallels between this story and films like Scream. Excellent story, I really loved it, and am looking forward to more. Dark, gory, and exhilarating, Jinxed by Thommy Hutson is teen horror with a plot that is both beautiful and nasty, crafted to jangle the nerves of readers. It is in the very private Trask Academy of Performing Arts that some of the star students meet their deaths. The deaths look random and accidental, but then Layna Curtis begins to see a clear connection between them all, and she thinks someone has decided to kill her friends by using a pattern based on superstition. The logic behind the murders leaves Layna with only one conclusion: she is to be the climax of the killer’s gruesome killing spree. Can she unveil the face of the murderer before it’s her turn? While the horror part of this story is engrossing, the writing is exceptionally good and Thommy Hutson creates a narrative voice that is hypnotic. The plot is complex and the pacing just right to keep the reader turning the pages. The gore punctuates the narrative and readers will get chills down their spines as they anticipate what could happen next. The tension builds fast and the climax is hugely satisfying. Character development is deft and there is an overall balance in the narrative that is striking. The prose is excellent and Hutson has the knack of filling the setting with the element of mystery that adds flavor to the horror. Right off the bat, readers are treated to the image of an eponymous island, “ensconced in a thick, white mist.” Then the high school, nestled behind the wall of nature, so private that anyone would wonder why. It is against this backdrop that the narrative happens. Jinxed is a gorgeous treat for fans of horror, with characters that are real and captivating. The Trask Academy of Performing Arts was the ideal high school for any student of the arts who wished to be “somebody” in Hollywood after graduation. The massive end of year showcase alone was worth the six figure price tag on a year’s tuition, since it allowed the students to perform their greatest work on stage in front of hundreds of big name talent scouts and talent agents. The parents of the students were even more anxious about the showcase than the students, since it could make or break their child’s future in the industry. Is it any wonder that Sydney, the shining superstar who even stood out in this exclusive program, was under enough pressure to make her crack and take a flying leap out of a third-storey window? At least, that’s what everyone thought happened... until the other murders began to follow, one by one... The brutal, seemingly random acts of violence appear to be tied to an old school legend about a student that died in a fire many years before, but will Layna and her friends be able to crack the code and stop the killer before all of their lives are lost? Jinxed, by Thommy Hutson, is a gripping young adult horror novel, styled after the old slasher flicks that captured the imagination of the public in the 80’s and 90’s. The plot is detailed and complex, and keeps you guessing until the very end. Certain to appeal to horror fans of all ages, this book is definitely one I would recommend if you enjoy murder mysteries, gripping story lines, and slasher style gore! Jinxed by Thommy Hutson is a spine-chilling tale with a well-imagined setting, a sophisticated plot, and memorable characters. In the secluded, idyllic Trask Academy of Performing Arts, a killer is out to slay some star students. While the murders look random—Crosby, Dillon, Daniel, Nancy—the popular senior, Layna Curtis, thinks there could be a pattern and that the victims aren’t picked randomly. Then she suddenly discovers logic in the murders and it seems she is destined to be the ultimate victim, the most valuable piece in the killer’s play book and her opening night is ominous. Will she mildly walk to her death or can she fight back, and how will she fight when she has no clue who the killer is? A heart-pounding thriller and a treat for fans of horror, Jinxed is a masterpiece that you are compelled to read in just one sitting. That’s the spell of it. If you are not seduced by the exquisite prose, then the plot will have you enthralled, and if you don’t find the twists strong enough, you’ll care about the characters so much that you’ll want to find out what happens to them. Thommy Hutson just makes it that way. That is, he condemns you to keep reading. Although I enjoyed the way each murder builds up to a surprising climax, it is the author’s turn of phrase and storytelling craft that kept my eyes fixed on the pages. The prose is insightful, evocative, and the author knows just how to give life to images and make them speak. One such example is when Nancy sees the body of Daniel: “The angry wound beckoned to her with a meaty, saw-toothed grin.” And this is just moments before she meets her death. Great characterization and a plot that is sophisticated and gripping. This is a tightly written story with great potential to absorb readers.